Monday: Was good, learned some new stuff with the weights at the gym, did real sit-ups with a 10 lbs weight, thanks Leah for holding my feet down. Weights stats here. The swim was good and the music was great. For Christmas I bought Leah a swim mp3 player, but accidentally ordered it twice. I have had issues in the pool where I get really really bored and just have to get out. The music is making all the difference right now. BTW I am listening to Aphex Twin Selected Ambient Works 85-92 and it works great for me in the pool. It makes me think about the future, but not as in tomorrow, but in the way I thought about the future when I was younger and read William Gibson, watched Ghost in the shell and spent my days on IRC. (I know super cheesy BUT awesome!) Swim Stats here. 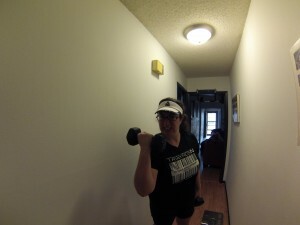 Tuesday: Morning trainer was a blast for a few reasons. #1 Leah loves SciFi as much as I do, so when we get on the trainers we usually watch action or SciFi movies and the goal is to split the movie into a few sessions of riding during the week. This week we watched Equilibrium . Think of watching a crude version of the matrix where they only saw the special effects but they took the story right from 1942. Bike Stats here. The run on the other hand, it was kinda cold and raining, but I came to work prepared. In my bag I had my running tights, and a pair of pants in case it warmed up. Long sleeve shirt, short sleeve shirt, arm warmers, gloves, hat, and running jacket. It was about 42f when it was time to go change and meet out at the wall (where all the runners in the building meet at noon on Tuesdays and Thursdays.) Only Leah and I showed up, I was in my tights, short sleeve shirt, jacket and hat. It was raining when we walked outside, but by the time we hit the end of the parking lot the rain stopped and didn’t start again until we got inside. So 3 easy miles at zone 1 (hard to stay so slow.) RunStats here. Wednesday: Same drill as Monday, but we were a little better about staggering our sets so we were not in each others way as much. I was able to do a few more sit ups, but then again I only did about 32 total out of the 60 I was supposed to. Weights stats here. The Swim was grand, I did my normal warm up, then fast set, then I decided to do 10 lengths of just kick board… I will do that for a while until I no longer hurt. One of the things that used to be bad for me was shin splints on runs. I got over that with some strength training and some exercises I can do at work. But when I do the proper toes pointed kick they come back with a vengeance. So For the rest of the month I will hopefully work on these. Other than that the swim was good, but nothing super special. Swim stats here. Thursday: We watched the next 30 minutes of that movie and you know it kind of just a little bit got better. SPOILER ALERT. I thought they did a great job with as the main character started to “feel” more, more color came into the screen. Very nice touch for explaining a concept of realization of the world around. I didn’t do as many miles on the bike, because I got so distracted by the movie. Bike Stats here. 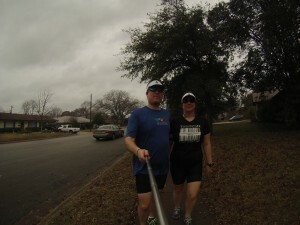 The run ended up being 74f out so shorts, a short sleeve shirt was great! We had 2 or 3 new people on the run, they stopped at 1 mile and waited for us to round out the next mile and head back. Leah had a meeting so she ducked out at 1 mile and ran back from there also. It was a struggle to keep my HR at 150ish. The weather was so nice and I was in a groove. I wanted to go so much faster. I did OK until the last quarter mile, then I just ran it out, hit 180 HR. Run Stats here. Friday: was a day off! Saturday: SLEPT IN! 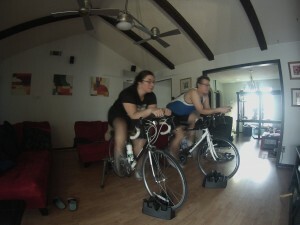 got up at 10:30 on the bike about 11, did a spin for 45 minutes. It was a fasting bike for this one, so I was a little grumpy, but we finished that movie, it ended almost exactly as I expected it too. All the way up to the super fake explosions. Bike stats. Ran about 30 minutes after we finished the bike, it was all relax time. Partially because I wanted to make sure I had the right stuff to do some filming on the run, copy everything off the card, wipe it start it new. After, puttered around eat some, drink some pure sport stuff. The run itself was amazing! One of my favorite runs in the area. Nice easy down hill then a slow steady up hill. It was supposed to rain, but instead it was just humid to the point of seeing the fog on the ground and there was a slight breeze at the end, just perfect. Also the longest run I have done since November. I loved it. Saturday runs are my favorite. Run stats here. We attempted to go to the pool but it was water walking time, and all the lanes were full. So we put that off until Sunday. Sunday: Cheer for the 3M half marathon, since it is only a few blocks from the house. I got to see 1 friend booking before any of the pacers. She ended up placing 3rd overall for women with just under a 1:20, and then we got to cheer on our friend Brian who finished in just under 2. Pool time: Easy easy swim, 28 minutes of cake. I did 10 warm up , 10 fast, 10 kick board, 10 LONGS… but then puled a muscle, so I only did 22 more random lengths then to the sauna for a round, then hot tub, then home for batch cooking day. Swim stats here. Monday: These weights were NO JOKE. I normally flit around the gym doing whatever I feel like that day, working the body parts, doing as many reps as I feel like… this was WAY different. I was very skeptical that I would be able to fully work my body in 7 moves but this definitely wore me out. My swim was uneventful. I’ve taken about 3 months off swimming first to train for the marathon in November and then during offseason it was just not in me to get to the gym (I ran or rode the trainer instead) so this was my first week back in the pool. I’m working on a lot of drills (head down – I just kinda sing the Les Mis song during those laps, pushing water with my hands not pulling, kicking faster, staying long, legs straighter), so I just feel slow and awkward. Also, I do LOVE having music but it definitely is taking some adjustments to keep it in my ears, so there is a lot of between laps futzing with the swimp3 player. Weights took ~50 mins the first time with stretching, and I got 1050m (70 laps in our silly little 15m pool) in 30 mins. Fueling was very different also, since we’re trying to work on getting closer to Racing Weight’s strategy. I ate a lot more carbs before this workout (about a 500 cal snack) and felt really silly about it, but definitely felt like I had more to give during the session and wasn’t ready to eat my entire kitchen once I got home like normal. So there may be something to it. Tuesday: Morning trainer rides are awesome. Favorite part of the week. Waking up with one eye open squirting a gel in my mouth really helps me wake up. I remember when biking used to be my least favorite and worst discipline, I think now it’s my most solid (though I am a bit of a scaredy biker outside). I was able to tackle 11.35 miles in 30:30 watching said sci fi movie. It went quick. I ate a gel and half a cliff bar before and as usual, nommed a jelly bean per mile (my trainer ride reward). I had a normal breakfast at work and then we headed out for our lunch club run. It was cold and yucky but it was my first run in 3.5 weeks so I loved it. And hated it. Our directive is to stay in zone 1/2. I normally run in like zone 100000. I like pushing myself. But, all I read is that you should do 80% of your runs slow-like-snail so I’m trying it. Though it puts some embarrassing-for-me numbers up, I’m hoping to counteract that with some MAD PRs during tri season. So you’ll have that 38:30 for 3 miles and know it’s me holding way back. Wednesday: rinse and repeat for Monday. I found dried mangos so that helped get some of those good happy pre-workout carbies in without the sheer volume of food. I finally got cleared for full weights that night, so I finally tackled the smith squat machine and piled on 90 lbs. Yeah. Not much, but it’s been a while and I didn’t want to fall over or kill my back less than 1 hr post-chiropractor clearing me for duty, so we’ll just go up from there. Swim was uneventful. Same bat pace, same bat time (1050m, 30min). Thursday: Morning trainer rides awesome, zone 1/2 lunch runs frustrating. 11.25 bike miles in 30 flat, 2.65 run miles in 33:33. Friday: Day off. This may be a third weights day in the future, but I felt the need for a rest day the first week back. Saturday: Woohoo, first brick of the year. Sort of. 45 mins on the trainer finishing up the movie to net me 17.11 bike miles, and then another stupid slow 4.2 miles (woo, long run) in 54:55. Then, some time dithering around, the point was to get a bike and a run, not a bike-run. Felt decent running flats and downhill and kept it under 150, and it was gorgeous in the 74-and-cloudy, but on the uphills, I may as well have walked. I did a few times until Joel reminded me THIS WAS A RUN. The running motion was just for show. And it was 150-160. Ridiculous, heart, ridiculous. I’m looking forward to actually getting my zones tested next week so I can know I’m doing the right thing. Sunday: We were set to swim on Saturday but due to a full pool, we rescheduled for Sunday. What can I say? More dithering with the swimp3, more drills, more feeling like an awkward fish with FLASHING MOMENTS of feeling like an efficient fish. I didn’t do any sprints and swam extra slow so my 70 laps took more like 31 or 32 mins. We were so cold, we did the hot tub before and after. So not a fan of “feels like” and anything below 55. Cheering at 3M, it was 31. Brrrrr… those days are the HARDEST to get in the pool, but get in we did. Overall: A solid first week back at it. Hit 12/12 workouts. Ready to keep establishing a routine and just showing up to work every day and doing what’s on the list. This may sound depressing or defeatist, but it’s not. After a good long off season, I’m just ready to work and get myself back to, and better than, I was before. And I know these long slow days may not be super exciting, but I enjoy the work and while nothing quite feels like home again, I can’t complain. Looking forward to three more weeks of “more of the same”. I may not link all my stats and craziness like Joel does, but I track on dailymile. Add me as a friend if you want to get all the deets. 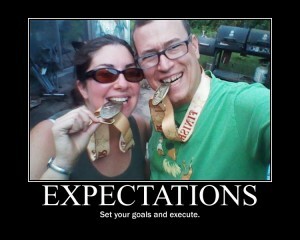 Last year I had a huge goal for 2012 – to do 24 races in 12 months. We were able to check that off the list, but it didn’t come without sacrifices elsewhere. I didn’t go hang out with friends nearly as much as I should have. I didn’t go to any Game Dev Beer Nights until after race season. I didn’t write as much as I wanted and I for sure didn’t read nearly as much as the year before (I read over 100 books in 2011, only about 80 in 2012). My motivation was to live my life in a way where I could race as often as was required to meet my goal. 2012’s 24 races in 12 months was amazing but it was draining and I accomplished what I wanted to out of it. 1. I was able to accomplish all my work and still get to every race healthy, fit, and ready to fight. 2. I was able to prepare properly the day of a race. We got the day before and the day of racing prep to a science (this will be a post in the future). 3. I was able to sleep before a race and not wake up every few minutes during the night. Before this I would be too nervous and sleep fitfully. Now I am way more calm about the whole process (most times). 1. Train properly for each race and distance. We will be using racing as a compliment to our A races, and not something to schedule training around. 2. Keep up with my nutritional needs for each stage of training. Eating as healthy as possible while staying sane, and fueling each workout properly. 3. Get better quality sleep the weeks leading to a race. Dependent on work hours as always, but making sleep a priority. My motivation: It is going to be TRI season in a blink of the eye. If I can commit to better habits of eating and sleeping now, they should be able to carry over into the times when I will need them the most.